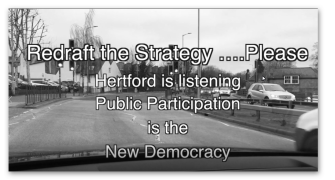 DO YOU CARE ABOUT HERTFORD? Hertford Civic Society is a charity which has since 1969 acted as a focus for residents interested in shaping the future of the town. * To stimulate the interest of residents in the quality of the environment in Hertford and the surrounding area and to maintain its character as a small market town. * To encourage central and local government, companies and private individuals to adopt high standards of architectural design, town planning and management of the environment. 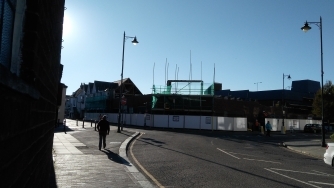 *To encourage appropriate development, improvement and conservation so that we and future generations can benefit from the good which we have inherited and safeguard Hertford’s life as a community in which we can live and work. To find out more about us, our achievements, how we pursue our aims, and what our current activities are, click on ABOUT US. The Society gave £500 towards the addition of 2 toilets to this attractive historic church, to enable increased public use of the building. You can see the chuch at the bottom here. In the past few months the project to erect blue plaques on buildings of historic importance around the town has been completed, and the Hertford Heritage Trail has now been launched in partnership with the Town Council. Free leaflets to guide you round the trail are available from the Tourist Office in The Wash opposite the theatre, and more information about the plaques project is available here. The County Council have now finalised the new Minerals Plan, and it will shortly be submitted to the Secretary of State. The Plan sets out the Council’s policies against which future applications for quarries will be assessed. An Inspector will be appointed to examine the Plan, and will hold public hearings and consider written objections. At an earlier stage we welcomed the fact that there are now no areas around the town designated as suitable for further quarrying, but said the Plan should make it clearer that the County Council will resist quarrying applications outside the designated areas. See our comments here and, more technically, here. Officers have agreed that an additional Policy is needed to address this matter; but have not so far said how they think the Policy should be expressed. Our Society was formed 50 years ago. Hertford has changed a lot over this time, as we like sometimes to lament – or applaud. Panel members will give their views, followed by a more general discussion. Roman Catholic church hall, starting at 8 pm (refreshments from 7.45pm), next to The Church of the Immaculate Conception and St Joseph, St John’s Street, Hertford, SG14 1RX, off Railway Street, near Hertford East station. £2 for non-members. Read the Society's formal response here - it runs to 7 pages, starting with a short summary. Hertfordshire County Council has been consulting the public on its ideas for the A414 corridor, summarised here. Amongst these is a possible new by-pass for Hertford, with a cost put by HCC at "up to £500 million". On January 16 Councillor Derek Ashley addressed around 150 people in the RC church - it was full! Most of the time was devoted to a lively Q&A - click to see report. Everyone was encouraged to express their own views on a simple feedback slip. The committee considered these, views posted on the blog below, and other views of members, in formulating the Society's formal response. The Inspector is still working on the appeal against HCC's refusal of permission for the first application. A second revised application was also refused by HCC. The old Minerals Plan forms part of the setting for these. Sadly in October 2017 the council approved plans to redevelop Bircherley Green. The Society expressed its views on this development in detail here and here. A few of our views were adopted, e.g. the bus station is to stay in its present location and not moved to Fore Street. The permission was formally issued on 5 January, following conclusion of the planning agreement. The existing buildings have been demolished on that part of the site where the hotel will be and has been reduced to ground level. 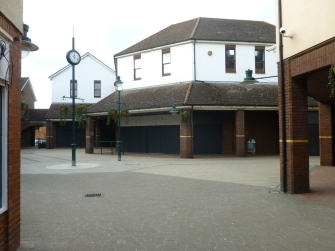 Other existing retail premises have been boarded up, and the car park and mall closed. The developers applied for approval of "non-material minor amendments" which the council refused in November 2018, on the grounds that many changes were material, including those to: the building's roof height and form on the Railway Street frontage, some windows, the hotel tower, and type of brick to be used. Another full planning application, with other changes, has been submitted and is still being considered. The new District Plan for East Herts was adopted in October 2018. It sets out planning policies and proposals for the District until 2033. We objected to several aspects of the Plan at the draft stages (e.g. loss of Green Belt, no consideration given to new settlements), but now that an Inspector has found it ‘sound’ and it has been adopted, any opposition to future planning applications which comply with the Plan would be futile. We remain concerned about the Plan’s support for the principle of a Hertford by-pass when the long-term consequences for the town of building, or not building, a by-pass have not been critically assessed. We particularly welcome the determination expressed by some Councillors that developers should be obliged to deliver their full quota of affordable housing in accordance with the Plan. We shall also be looking to the Council to enforce the stringent new provisions on air quality which were inserted into the Plan partly in response to our objections. For more information, study the end of the Projects page. The Society believes that the markets are an important part of the town's street scene, and would like to see them flourish. With this in mind we have engaged with the markets' new supervising authority: East Herts Council. Three markets run in Hertford: one on Saturday, a monthly farmers market also on a Saturday, and a monthly street food market. We carried out a set of interviews with traders, and sent the results in a letter to the Council.